The definitive guide to paint by the nation’s most sought-after color consultant. 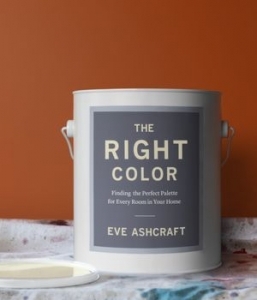 When Martha Stewart was developing her first paint collection, the Araucana Colors (based on the hues of her chickens’ eggs), she turned to the nation’s top color consultant: Eve Ashcraft. Eve helped Martha to pinpoint the colors of that enormously successful paint line, thus assisting in transforming an industry along the way. In her first book, The Right Color, her own curated palette (her paint line launches this fall) and countless other favorite shades and color combinations provide inspiration for every room in the house. Packed with trade secrets, such as how to make a small room look bigger, how to use color to brighten a space, and how to use paint to resolve myriad architectural challenges, this book will give anyone the confidence to choose a palette that will make the most of any space.